As I said, tears in a Pixar are no big deal. What I didn't expect was to be welling up in the first five minutes because of sheer sensory overload. This film is gorgeous, people. There's a blip of a scene where the main gal Merida is scaling a cliff face in a Celtic-y dress with her corkscrew red hair flying everywhere. She pulls herself up on this treacherous-looking rock and she's drinking out of a waterfall and squealing in glee and I found myself all trembly-lipped and thinking, "Someday I will have a daughter and she will be awesome like that." 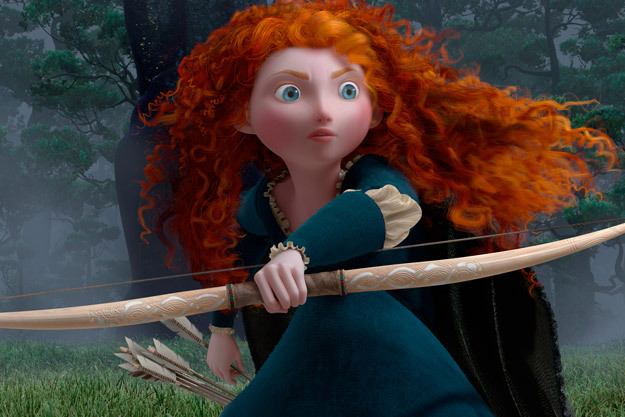 This was not the first time I thought that about Merida. She's not what one reviewer cleverly catagorized the "market-tested" modern Disney princess. She's not yearning for fictitious greener pastures or waiting for her prince to come. She's headstrong but not foolish, she's a little selfish, she's fun and yes, she's completely badapple with a bow and arrow. However, the most astonishing twist in this film was the role of Merida's mother, Queen Elinor (voiced by Emma Thompson). A princess with two parents in any medium is uncommon enough (see this excellent post by Shannon Hale), but I think Pixar really nailed it with this particular parental duo. King Fergus and Queen Elinor are a perfect complement to each other, with Pixar avoiding the all-too-common pitfall of neutering the man to emphasize the woman's power. There's a scene where Queen Elinor breaks up a brawl between several hundred Scotsmen just by wading into the fight. The men part like minnows because her decision not to engage reminded them of the real reason why they'd gathered in the first place. Queen Elinor fills a surprising chunk of the storyline, morphing it from your typical headstrong-princess-rejecting-the-idea-of-an-arranged-marriage story into something much richer. Brave is a story about the love between mother and daughter, about owning up to your mistakes, about putting your family first. The payoff in the end was one that--surprise!--had me weeping far into the credits: a relationship strengthened, a tapestry mended, a new one begun, all delivered in that soft-handed, sly way that Pixar has.